DuraCling UV Static Cling Vinyl is a soft polished flexible vinyl adhered to a cast coated flexible board. 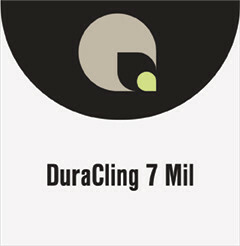 DuraCling is available white or clear. Static cling vinyl on a 10 pt. coated cardstock. Adheres to glass or polished surfaces without the use of adhesive. Use for window displays, children's stickers, game pieces and other promotional pieces. Quality recommends 54" material if printing with latex inks.